A voice of reason that we can rely on, when we find ourself in any kind of danger. The Ego mind, is on the other hand loaded with our past as well. Previous memories, former situations, past hurts and discomforts that have left an impression on us, so you see it has an arsenal of ammunition that can cause us a great deal of suffering also. Our intuitive nature, or better known as the Soul, is the true essence of who we are, it is the part of us that is very different from our Ego mind. Our Soul is our best friend, but in respect to our Ego that is certainly not the case. Our Ego thrives on drama, our Soul seeks only for the essence of love. The Ego wants everything to be in discord, and out of sync, the Soul on the other hand wants only peace and harmony. The stronger your intuition grows the weaker your Ego becomes, in other words the more you trust and rely on your gut feelings, the less you will allow your Ego to inflict it’s purpose on you. 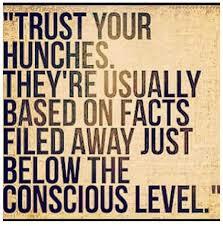 The internal work involved in strengthening your intuition isn’t easy, it takes a lot of faith, trust and patience. The very first part of the process to becoming less problematic and more in balance with your life, is to recognize when your Ego is doing it’s dirty work on you. As soon as the Ego detects clues to your ‘changing mind’, the more it will try to latch on to what it loves the most, your past.